Jiffy cake mixes are basically flour, sugar, shortening and flavoring. Adding egg and water makes that a cake, but if you add margarine, like this recipe suggests, you turn it into a very rich flavored streusel sort of thing that bakes into something like a cobbler. This recipe and its variations have been making the rounds for about forty years and I wouldn’t be surprised if we saw this pop up in a few more boxes in the near future. 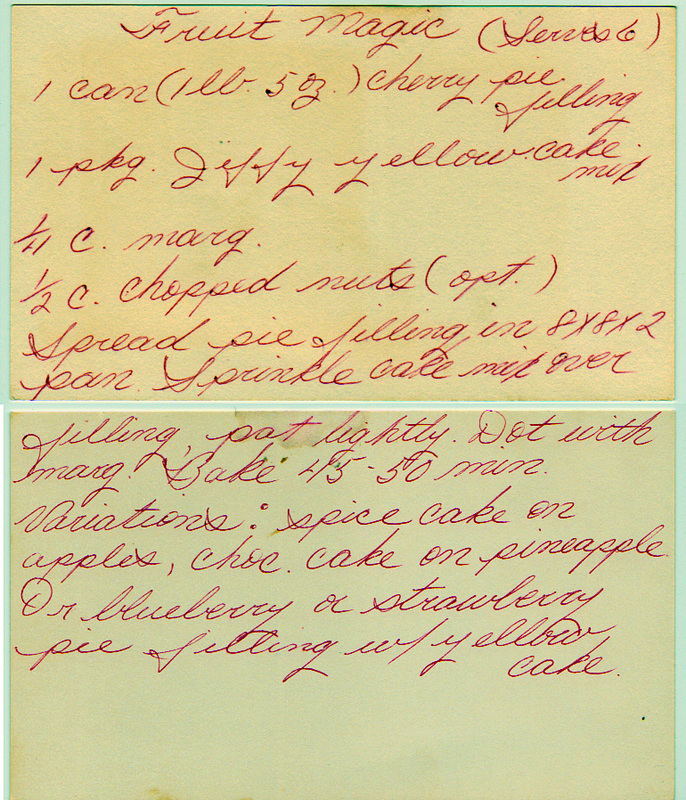 Spread pie filling in 8x8x2″ pan. Sprinkle cake mix over filling. Pat lightly. Dot with margarine. Bake 45-50 minutes. Variations: spice cake on apples, chocolate cake on pineapple, or blueberry or strawberry pie filling with yellow cake. Yesterdish suggestion: Jiffy yellow cake mix boxes say to bake at 350 deg., and sure enough, that’s what you should use here. It’s amazing how many recipes with fruit in the name don’t specify any particular fruit.